Our backyard is small…seriously small. From side to side it only measures 36 feet and from the back of our house to the fence, it’s only 20 feet. I grew up in Texas where even modest size houses have ample yard and sprawling trees. That’s not the case here in Calgary and it was something I had to adjust to. We’ve now lived in our house for almost 6 years and I have fallen in love with our family friendly backyard. In the warm months, it’s a haven for the kids and an oasis for the adults. 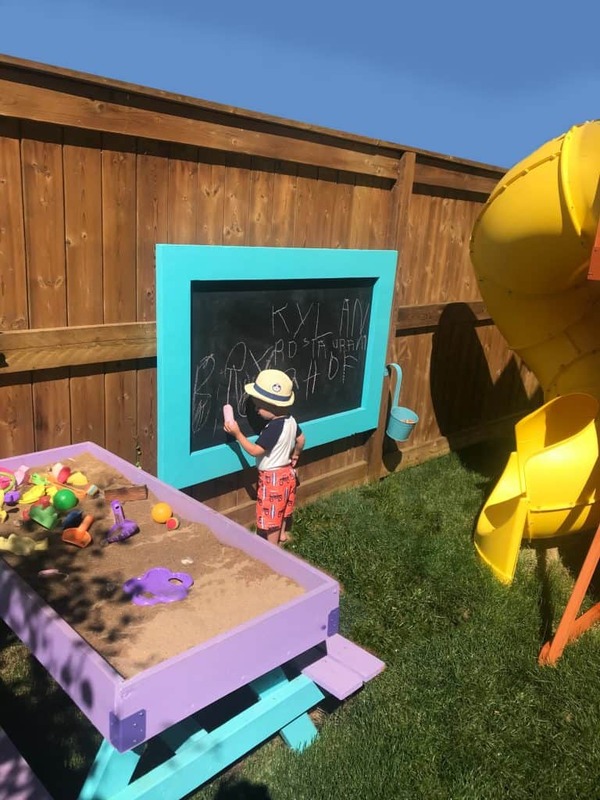 If you want to have a family friendly backyard where you can capitalize on your time together, welcome friends, and even better, make happy memories, read on for 14 tips to incorporate no matter how big or small your lot is. One of the things I love most about our yard is that there is both kid and adult space. 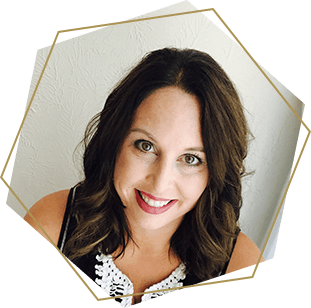 There are no hard boundary lines, but there are definitely areas that are focused towards the kids and others where the adults congregate. The adult area lays the foundation for the backyard design. Note: If you’ve been around Our Happy Hive long, you probably already know that my husband is a “Carpenter Bee” – he is very gifted at building things from the ground up. If you don’t have a “Carpenter Bee” in your family, any of these builder projects can be outsourced. Take a look at 7 things that can be done in each area to make it a super family friendly backyard. We built a two-tiered deck with the highest level a few feet off of the ground and the lower level only 8 inches from the ground. The deck easily takes up 1/3 of our green space, but it has been so worth it. We find that we are 100 times more likely to go out and sit on the deck than we were when it was only grass. Having our lower level so close to the ground is nice because our toddler can easily get up and down on his own or we can sit on the edge to be able to more closely interact with the kids. So this goes hand in hand with building the deck. Once you have a platform, you need something to put on it. I’m thrifty at heart so I watched for the end of season sales, compared prices, and measured the space to find the perfect arrangement for our deck. We intentionally bought modular furniture so that we could break it up and separate pieces if we ever wanted to rearrange. After gaining inspiration from other DIYers, we built two raised garden beds that flank our deck. I can’t tell you how thrilled I’ve been with this decision. The raised beds are approximately 3 feet wide and 3 feet deep by 11 feet long. We put about 12 inches of rock in the bottom and then filled them with soil. I love that the raised beds frame our lower deck so that you feel like your sitting in a garden. Because they are off the ground they don’t have as many pests or weeds. I can also control the quality of soil for the vegetable garden. 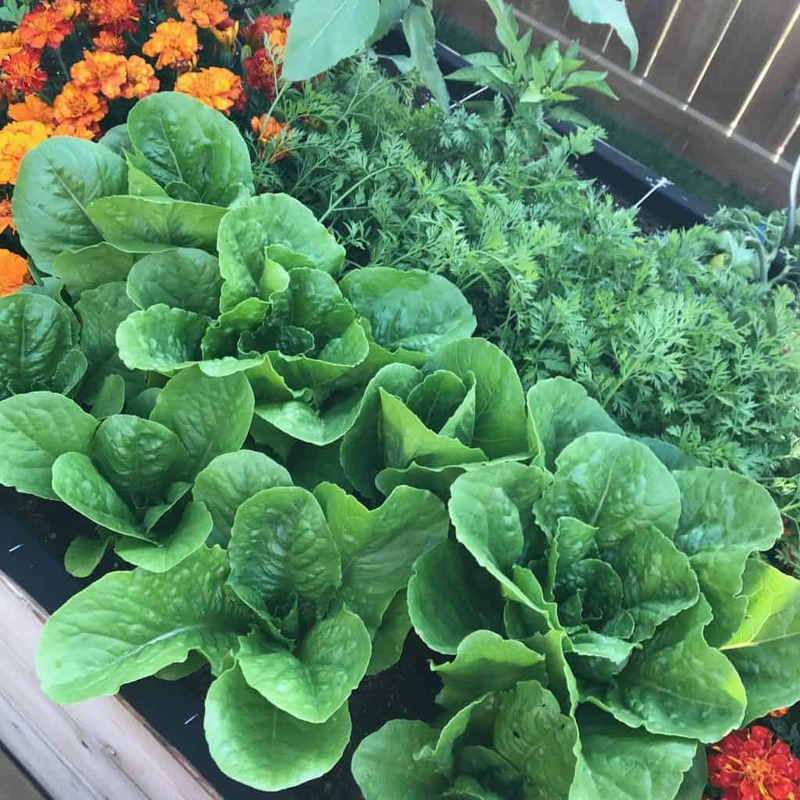 This year I made a special mix of soils and added about 6 inches to the top of our vegetable garden…it has made such a difference in the produce. Most importantly, all of my gardening work can be done while standing and not hunched over. I can plant seeds, prune, and do the minimal weeding that’s required without hunching over. Next, we built a square foot garden in one of the raised beds. Square foot gardens are perfect for small spaces or yards where you don’t want to dedicate a large amount of space to a vegetable garden. You can read about it here. Flowers bring color and beauty to any yard. They can be fragrant, bold, or delicate. 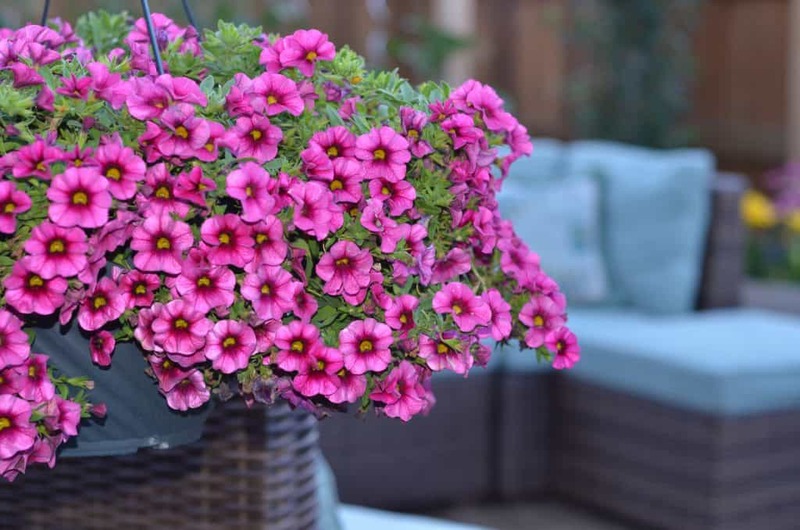 We’ve incorporated hanging baskets around the yard and dedicated our second raised bed solely to flowers. It also makes me happy that our flowers are safe for bees and can help encourage the bee population (which is dying off due to pesticides). 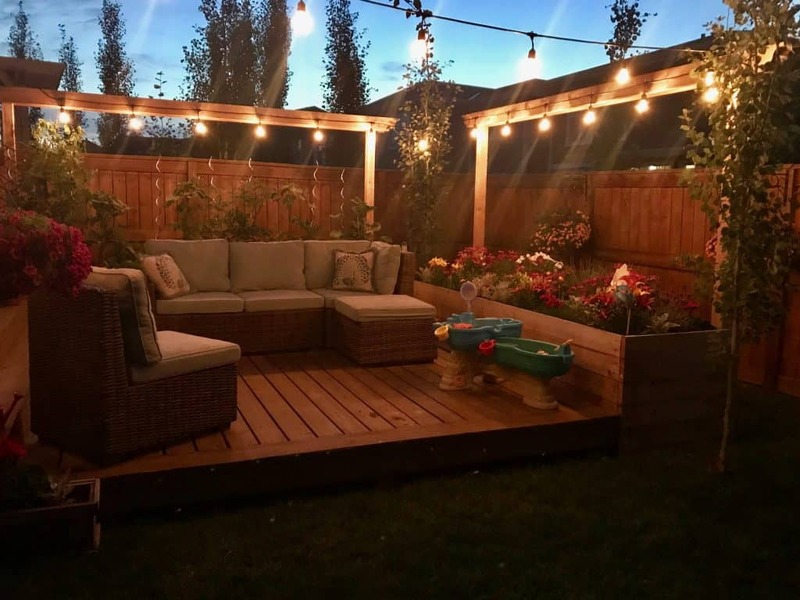 String lights add charm to any outdoor living space. They are functional as the sun goes down and are a fun aesthetic for dinner parties and evenings outside. Even if you have the most beautiful yard, bugs can be a huge deterrent. We got a machine this year to help minimize the pests and let us enjoy our time outside day or night. 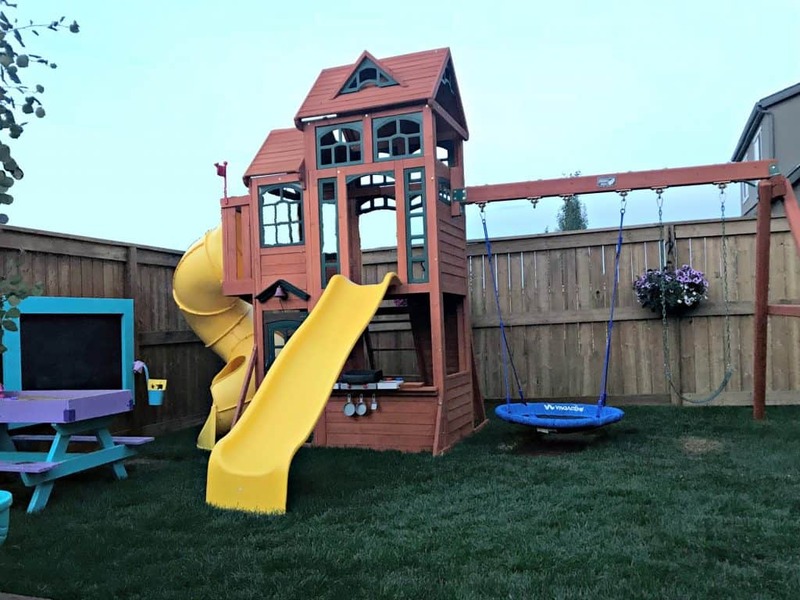 A family friendly backyard wouldn’t be much without things for the kids. 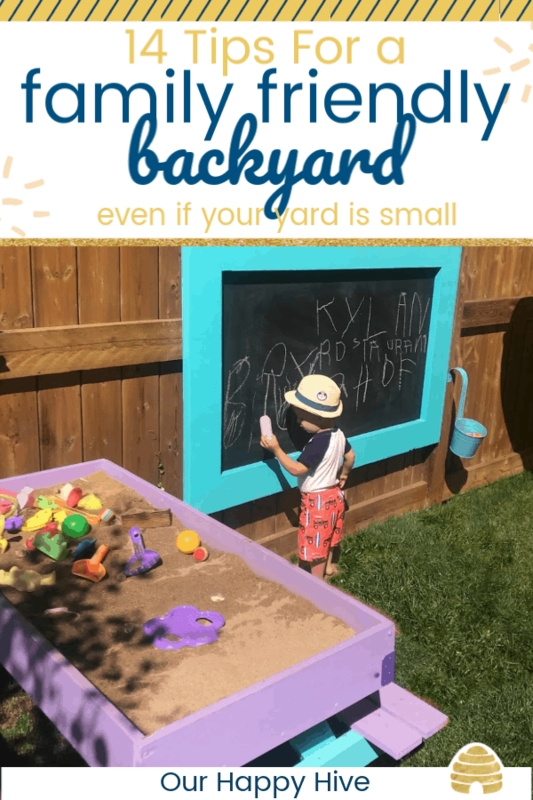 While the beauty of a backyard is pretty much lost on the kids, 110% of their focus is on having fun and engaging in a wide variety of activities. Our kids are young, 4 and almost 2 years old, so their attention span is short. We aim to have many different things they can do in order to keep them interested for a morning or afternoon outside. Below are some of our favorite things we’ve done. Some are simple adds, while others take a little more time to build. This was one of the first kid toys we bought and 3 years later it is still being utilized. Water facinates kids. They love to pour from cup to cup or transfer from place to place. It gets daily action at our house and is a vital aspect of kid play. Another hit is a splash pool. Initially, we bought a small wading pool that was made of a hard plastic, but we found it difficult to store. Now, we have an inflatable pool. It’s convenient to store, but you have to be cautious about getting a hole in it. Either way, the kids love to play in it. Sometimes they get in it completely, but other times, they just splash around or put toys in it. Our vision for a sand box evolved overtime. Initially, we bought a simple plastic box that sat on the ground and had a lid. The main problem was that it got bugs in it, especially spiders. Next Mr. Carpenter Bee built a sand table. This is our second year with it and it has held up nicely. There are never bugs in it. Place the lid on top if rain is expected or if you want the kids to use it as a picnic table. I love the fun bold colors too! You can get the blueprints from MyOutdoorPlans.com. This is our latest addition. It was built mostly from scrap lumber we have around our house. (Remember, Mr. Bee has had a few projects over the years) This simple project took a few hours to build. Little Miss. E got to help paint it. We hung a bucket from the dollar store beside it to hold the chalk. In the few short weeks, it’s been up, it’s already been a hit with the kids. This is an easy one. We’ve bought inexpensive plastic toys from the dollar store and more involved games from Amazon or Walmart. A Few examples are Tether Ball, Lawn sized Tic-Tac-Toe, a giant Connect Four, or little things like plastic bowling pins or golf clubs. There’s nothing like having some good old-fashioned fun with a water hose or a sprinkler. 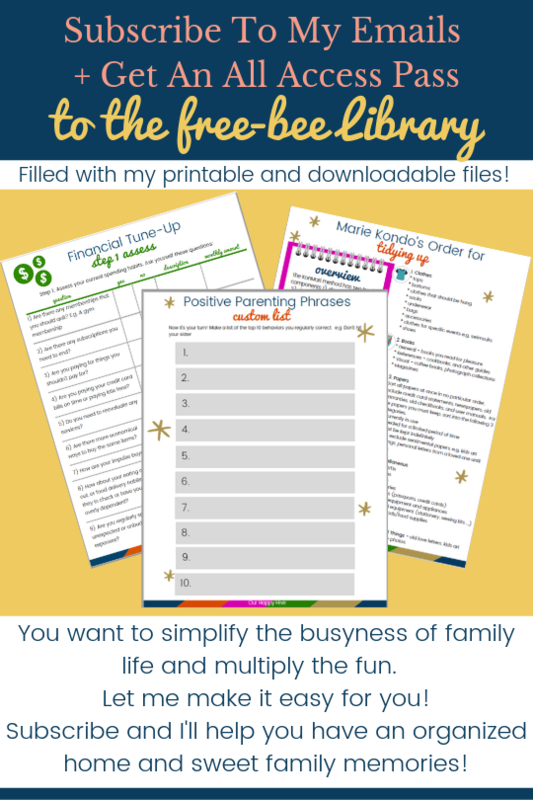 The kids love it, it’s easy, and you can cross watering the grass off of your To-Do list! Now this one was more of an investment. After considering purchasing a play structure for a couple of years, we finally bit the bullet and bought one this summer. It was somewhat of an impulse buy because there was a sale that we couldn’t pass up. Initially, we were hesitant to buy one because we questioned if the kids would really use it after the first few weeks. I’m happy to share that they use it daily, multiple times a day. We’ve now had it for a couple of months and they are in love with it. One of the things we added to the set was a round saucer swing. It’s big enough to fit two kids on it and they can sit up or lay down while swinging. Another HUGE hit! Each year I fall more in love with our little backyard. In the evenings it’s a sanctuary for me, in the day time it’s filled with joy and laughter. No matter the size of your lot, you can make it into a family friendly backyard. Having a space that’s appealing to adults as well as kids is essential. Beautiful flowers, vegetable garden, and string lights add to the ambiance while a variety of activities for the kids peaks their interest. Don’t let another summer of avoiding your backyard pass you by. Make the most of your greenspace and develop it to help create happy memories as a family.